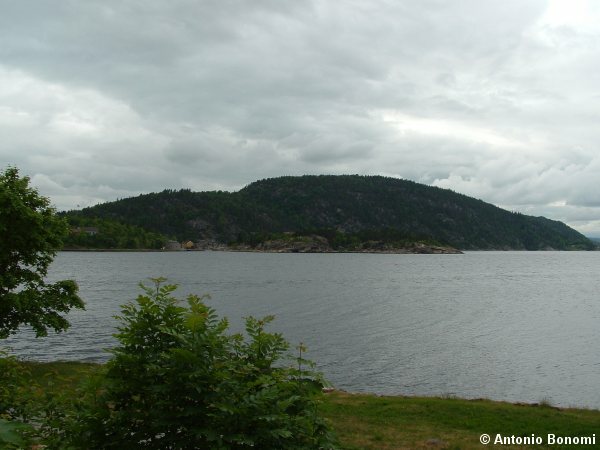 Here we continue with the Norwegian Fjord analysis in relation with the German KM warships. 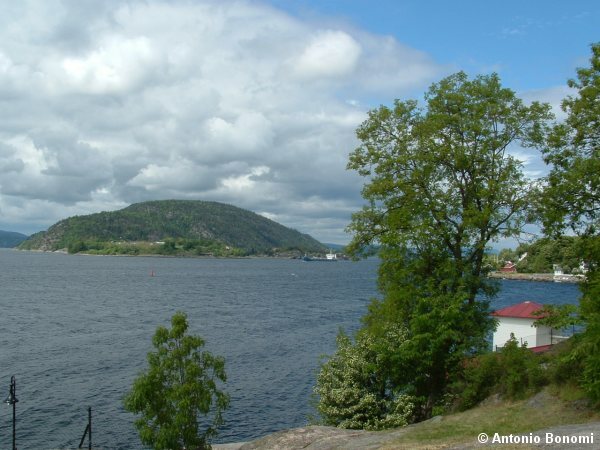 The Oslo Fjord is very famous for being the place where the heavy cruiser Blücher found her grave. 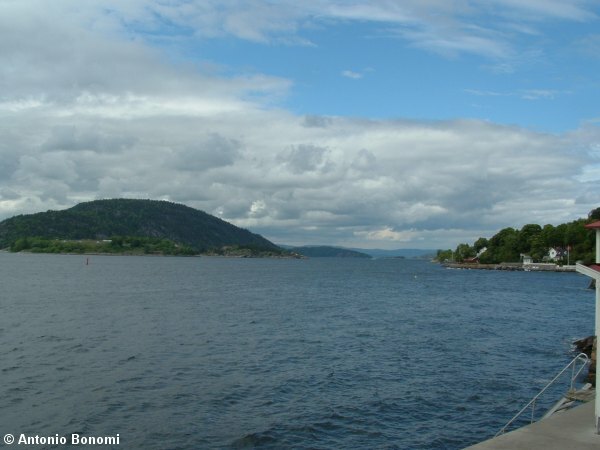 Then you can click on Oslo and start enlarging with the zoom option the area up until you have a clear view on how the Fjord is oriented. 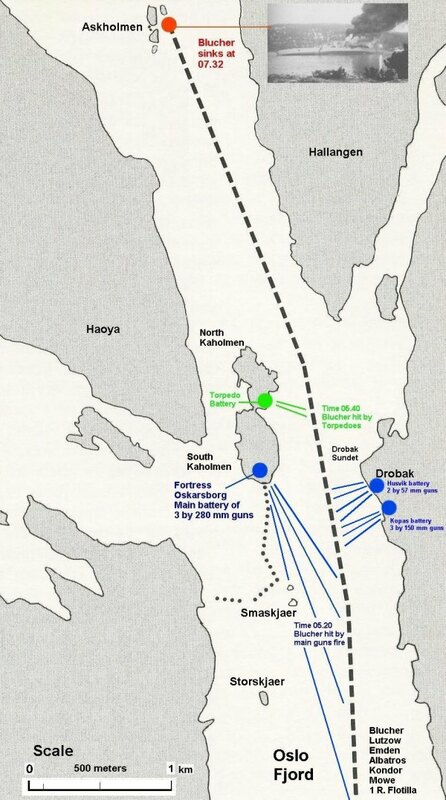 After having done that you will be able to perfectly understand this map that shows the entire OsloFjord from the beginning till the city. 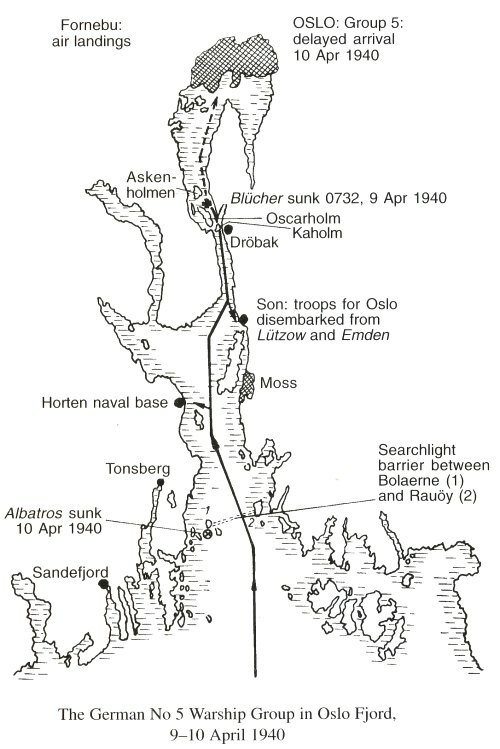 The map shows you also the course of the German Task force invading the area during Operation Weserubung on April 1940. Now you can evaluate how narrow that area is by looking at this ship sailing into the area on the opposite direction compared to the course run by the Blücher. 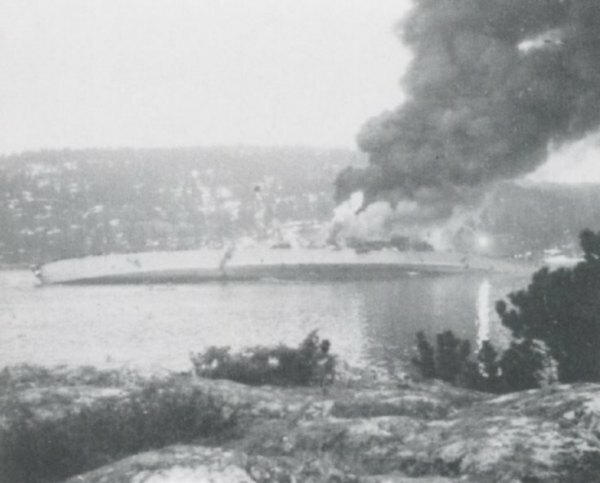 This ship is leaving the Fjord while the German were entering into it. Then we have some closer views, first from an airplane. 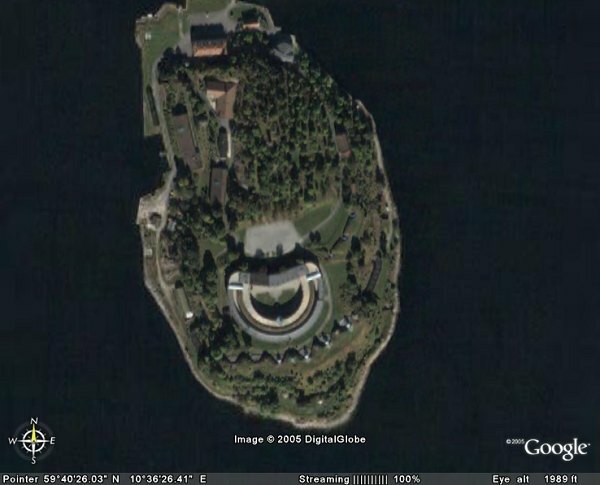 ... and then from satellite, note the main gun platforms. Last edited by Antonio Bonomi on Wed Dec 28, 2005 11:58 am, edited 1 time in total. 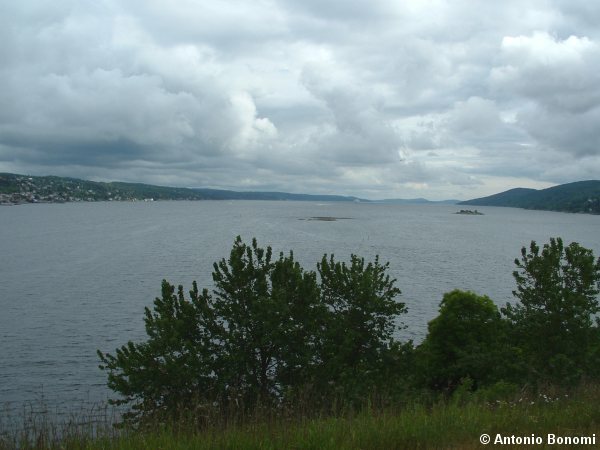 Here is the view of the Oslo Fjord entrance from the Oskarsborg Fortress guns. You can see a ship coming into the Fjord, so you have a perspective of how they saw the Blücher and the other ships coming that morning . 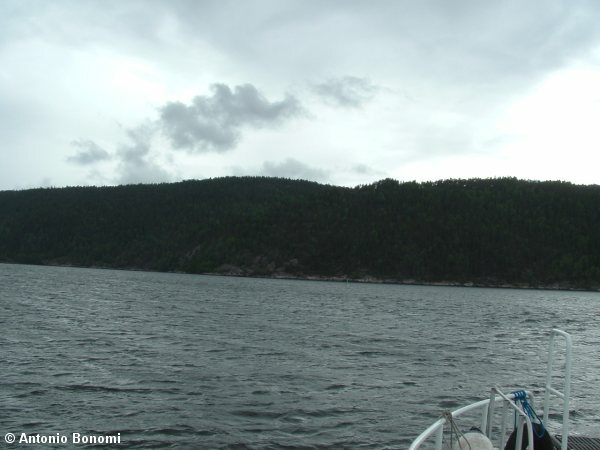 Now a view of the Droback Sundet entrance from the guns hill position. The small boat is passing exactly were Blücher passed after being hit several times by the guns. ... and one of the guns rotating platform which gives you an idea on how fast and precisely those big guns could have been oriented to the target. Those guns delivered several shells to Blücher, together with many others from the smaller caliber batteries. But it was not over for the Blücher as the price to be payed was much higher than this. After being hit several times by the guns and with fires on board the Blücher kept on advancing into the Droback Sundet. 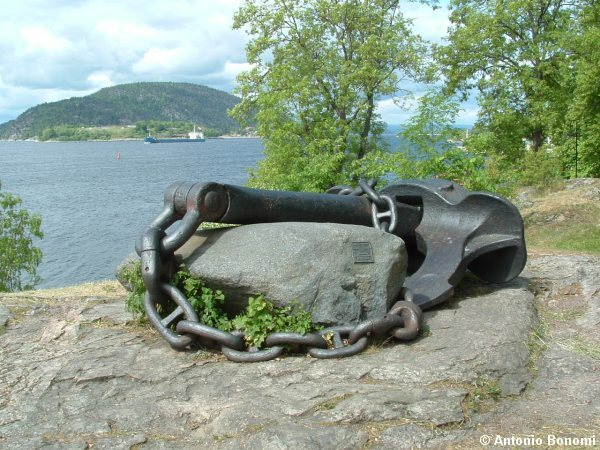 They did not know that the Norwegians had a Torpedo battery located into the North Kaholmen island. 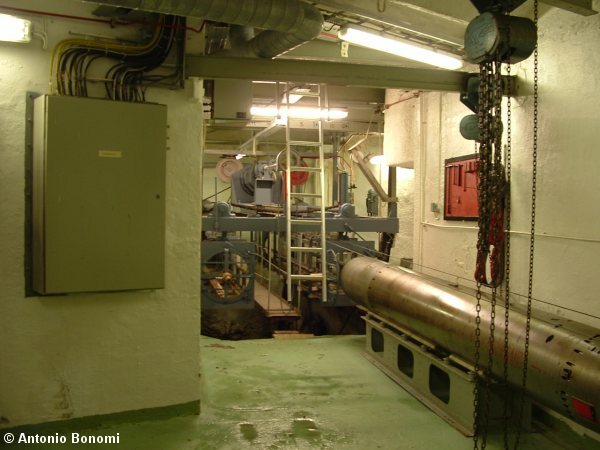 The Torpedo battery was located into the rocks, with tubes loaded above water level and when ready lowered below the water level with a mechanical system. 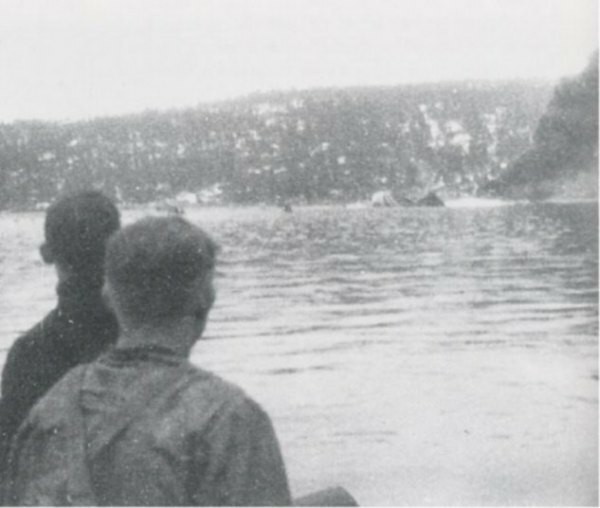 The Torpedo battery was able to fire precisely when the target ship was into the closest area of the Droback Sundet, exactly where this ship leaving the Fjord is on this photo (sailing into Blücher opposite direction). 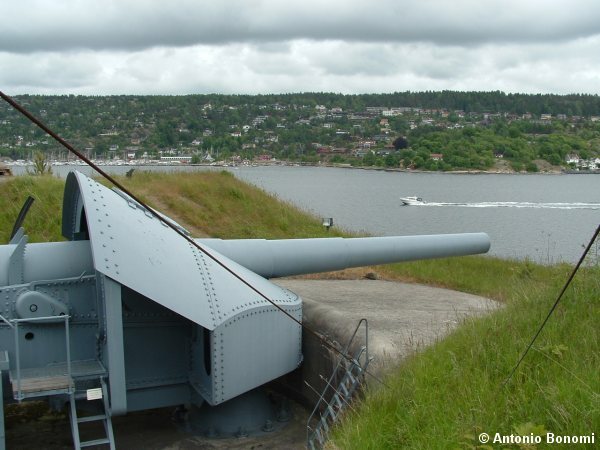 ... and when Blücher had just passed the Oskarsborg Fortress guns, a couple of Torpedoes were fired to her, just like these boat wakes simulate. and they both hit the German heavy cruiser from very close distance with devastating results. 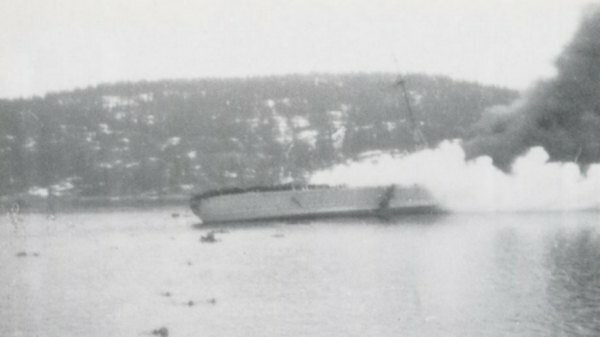 After being hit by the 2 Torpedoes the Blücher proceeded into the Fjord. 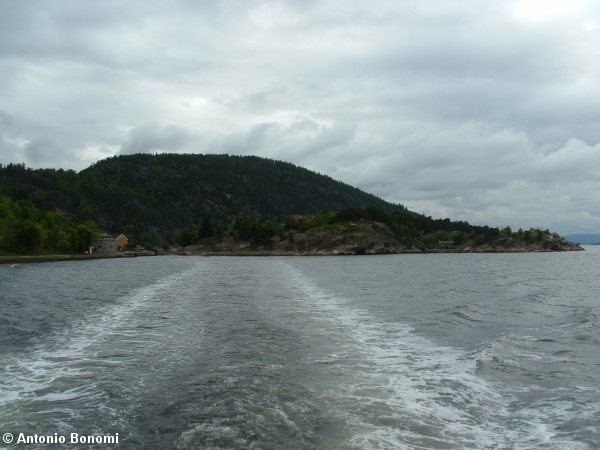 The crew tried to save her as they moved the ship on the Askholmen island area, but the ship was mortally wounded. After 2 hours, at 07.32 the ship sunk. 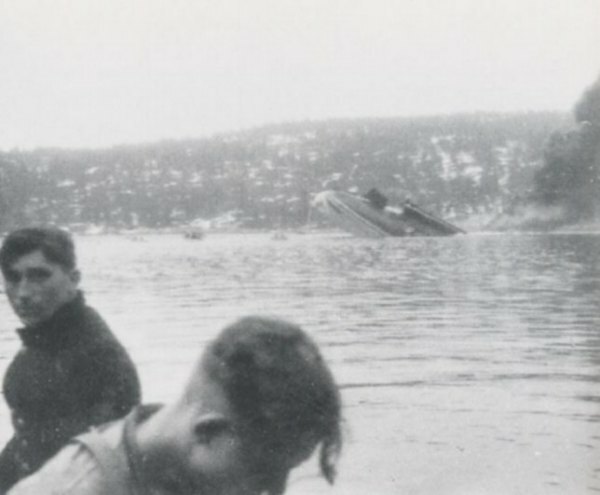 ... and the survivors on Askholmen island looking at their ship going down. Finally how the place looks today. 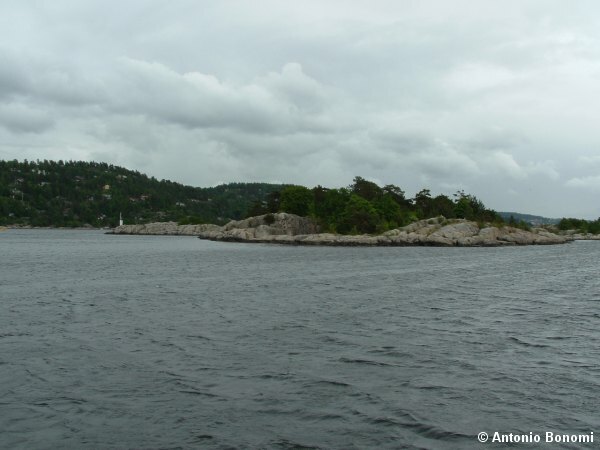 ... and the Askholmen islands. Antonio, excellent account on the sinking of the Blucher, brief but very informative yet. Mi personal congratulations for the posting and the recopilation of photos. If you have time, don´t you like to do a similar one about the battle of Narvik? I think it will be welcomed by everyone in the forum. You are right, it is of course a short description of the events, but I wanted to give the exact perspective of the events in relation to the proper places and the references, as this post like the others dedicated to the Fjords is about the places and to help everybody to find and look at them, .. hopefully being tourist one day and visiting Norway . But I am sure that also others can enjoy.... even if they never go there . I will see what I can do for the Narvik battles, ..
Last edited by Antonio Bonomi on Thu Dec 29, 2005 8:20 am, edited 1 time in total. Nothing better then pics and maps to understand properly what happened. I have to examinate more carefully the story of the Weserubung Fall to understand what pushed Kummetz to go inside such a trick. 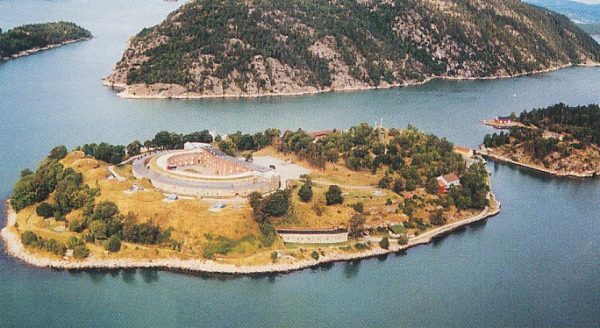 If I'm not mistaken, the Germans knew about the fjord defence and coastal battery, isn't it? Very nicely done! 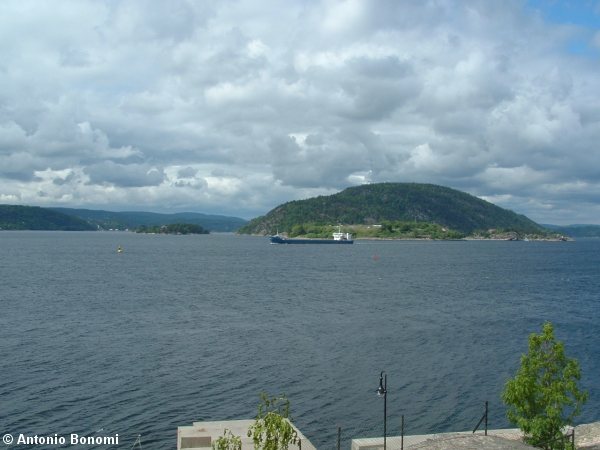 As you may remember from prior forum discussions, I sailed up Oslofjord to Oslo in September, 2004 on the overnight ship from Copenhagen, and was on deck in the morning when we passed through the narrows and over the resting place of KM Blucher. It was an emotional experience for me as a fan of the ships of the Kriegsmarine! I wish I would have had your posting with me then. More reason to go back for another visit! YES, I remember when we spoke about it . 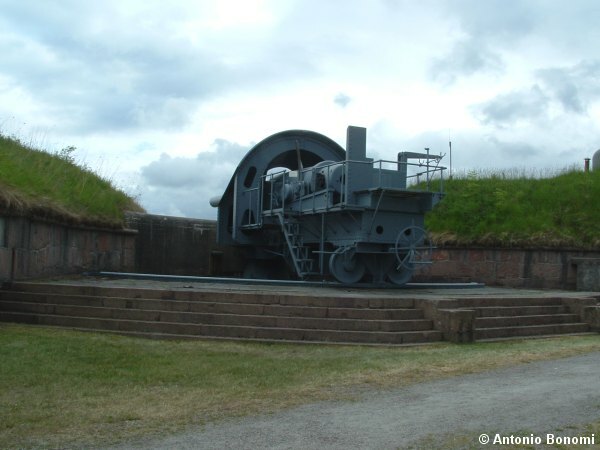 One aspect on this is that the Oskarberg guns only had blank shells to fire. The torpedoes finshed the job. What do you mean by "blanks"? marcelo_malara wrote: What do you mean by "blanks"? Blanks are shells with no explosive charge, ie they can't explode when they hit the target. This is called solid shot I think, blank is a cartridge without bullet. marcelo_malara wrote: This is called solid shot I think, blank is a cartridge without bullet. Yes, that must be right, as blanks are used in the ceremonial firing of guns - we can't have people being hit by shellcases!! !